The Japanese Yen is increasingly resembling a patient with split personality disorder, moving in one direction (down) against the Dollar while behaving quite differently against other currencies. For most of the duration of the credit crisis, the Yen had mirrored the performance of the Dollar, both of which had performed well as so-called “safe-haven” currencies. For a while, the Yen even outpaced the Dollar, rising to a 13-year+ high. Over the last five weeks, however, the Yen has fallen off against the Greenback, while maintaining its value against other rivals. It’s unclear exactly what’s driving this split, but careful analysis suggests it is a product of changed investor psychology. To elaborate, the Yen’s precipitous rise was due to financial- as opposed to economic- factors. As investors fled emerging markets en masse and unwound carry trades, it spurred a flood of capital back into Japan. This was not because the Yen was anything special; far from it, in fact. Rather, it was because the alternatives were perceived to be substantially more risky. This began to change in earnest when it was revealed that the Japanese economy shunk by over 12% (on an annualized basis) in the recent quarter. Given that Japan’s economy is famously dependent on exports, it didn’t take long for investors to connect Japan’s sagging GDP with its strong currency. This prompted speculation that Japan would intervene in forex markets in order to prevent the Yen from rising further. In the end, Japan didn’t spend a dime. Fortunately, it didn’t have to, as investors took the hint, and sent the Yen tumbling against the Dollar. 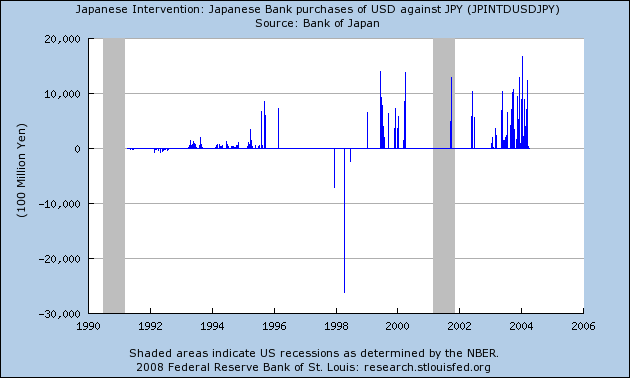 Technically, Japan hasn’t intervened since 2004 (see chart), but the threat of intervention combined with low interest rates ensured that in this case, words spoke just as loud as actions. It should be noted that Japan will use a small portion of its reserves to fund domestic economic initatives, but for now at least, none of it will be used to purchase Dollars in the spot market. So why hasn’t the Yen reversed course against other currencies? Its stock market is sagging, and its economy is in equally bad, if not worse-than-average shape. The answer lies in interest rate differentials and investor risk tolerance. The rate gap between the Yen and the highest-yielding currency (New Zealand), has shrunk to less than 3.5%. Excluding Australia, and to a lesser extent the Euro, interest rate differentials are effectively negligible. Accordingly, investors have decided that the gains from an additional couple hundred basis points in yield are not offset by the perceived increase in risk associated with currency volatility. That this theory holds water is evidenced by the fall in the Japanese Yen that immediately registered when the Bank of Australia opted to hold rates steady at its most recent meeting. I’ve seen a correlation between the dollar and the Yen, where when dollar makes gains, the Yen makes even bigger gains, and when dollar weakens, the Yen weakens more. This doesn’t happen all the time…but in major moves this correlation is strong.